British Prime Minister Theresa May leaves after addressing a media conference at an EU summit in Brussels on Friday. In the corridors of the Europa building in Brussels, European Union officials gathered around a small table, determining the fate of the country that had voted to reject them. U.K. Prime Minister Theresa May was relegated to another room while the rest deliberated: Would May get the months-long extension she had requested to give her time to negotiate a Brexit withdrawal arrangement with Parliament? Ultimately, May got an extension — but not the one she was hoping for. 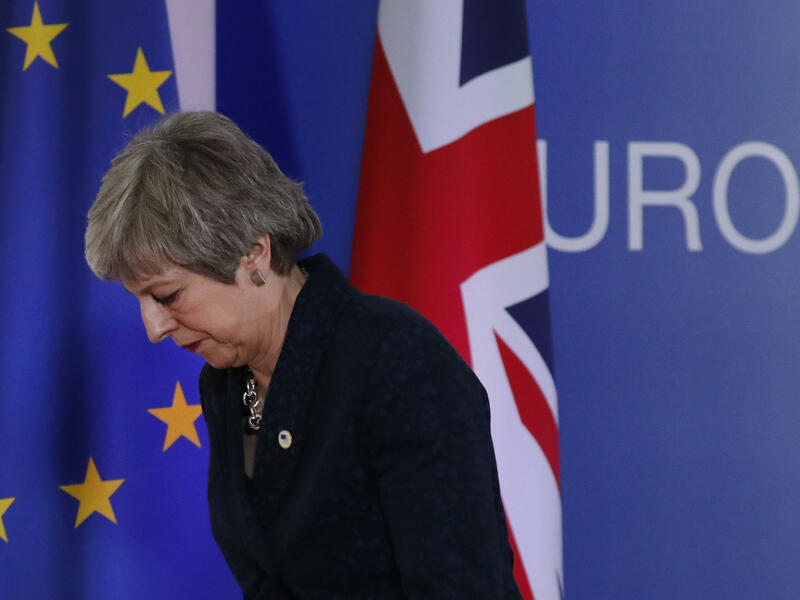 After several hours of negotiations, leaders of the 27 remaining European Union countries unanimously agreed Thursday to postpone the March 29 deadline for the United Kingdom to depart the political bloc. The EU offered two alternative deadlines — one if U.K. lawmakers can agree on a path forward, and one if they cannot. If May can persuade members of Parliament to accept her Brexit terms, then the country will have until May 22 to get everything in place — one day before European Parliament elections begin. If, however, May cannot persuade lawmakers to agree to the deal they've already rejected twice, then the country will get just an additional two weeks — until April 12 — to figure out next steps. According to Donald Tusk, European Council president, "What this means in practice is that, until that date, all options will remain open, and the cliff-edge date will be delayed." The U.K. government now effectively has four choices, he said: "deal, no-deal, a long extension or revoking Article 50." Article 50 is the provision of the Lisbon treaty that allowed the U.K. to voluntarily leave the union. If the U.K. can't figure out what it's doing by April 12, "the option of a long extension will automatically become impossible," Tusk said. In practice, a nondecision by April 12 could mean an abrupt end to the country's membership in the EU, with continued political and economic uncertainty for both parties. After the meeting with EU leaders, May said that Britain would definitely be leaving the bloc one way or another. If Parliament rejects her proposal once again, "at this point we would either leave with no deal, or put forward an alternative plan," she said, according to The New York Times. But EU leaders overwhelmingly felt that May's enthusiasm showed she was out of touch with political realities, The Washington Post reported. One diplomat told the Post that May's assessments were "a bit like coming from another planet." A petition on Parliament's website calling for Article 50 to be revoked — in essence, canceling Brexit altogether — has received more than 2 million signatures. But May said Thursday she "will not countenance" revoking Article 50. A spokeswoman told the Guardian that "failing to deliver on the referendum result would be a failure of our democracy" and would be unacceptable to May.